According to the 2016 Wells Fargo International Business Indicator, 47 percent of U.S. companies expect profits from international business activity to increase this year, and 87 percent agree that international expansion is needed for long-term growth. With many businesses focusing on international expansion, from maximising their online profile to the use of virtual phone numbers in order to increase local presence, it’s important to be mindful of the different business cultures you may encounter. 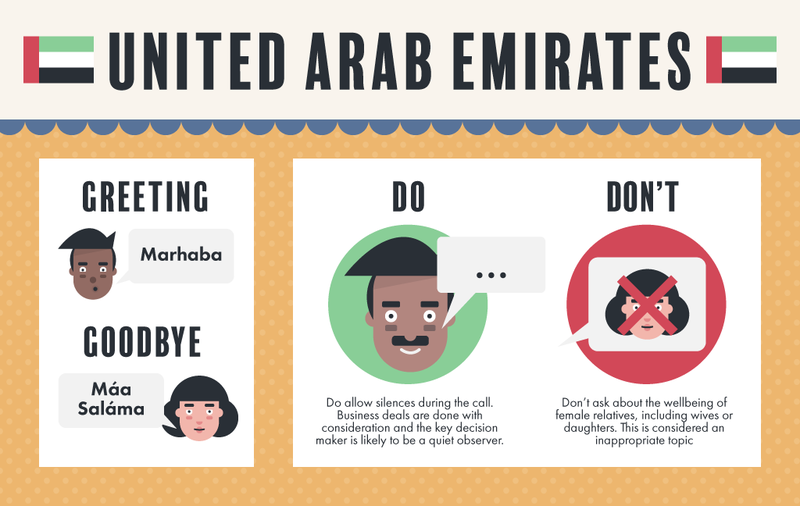 We spoke to business leaders and etiquette experts for advice on avoiding communication mishaps while conducting business across borders – over the phone, or face-to-face. 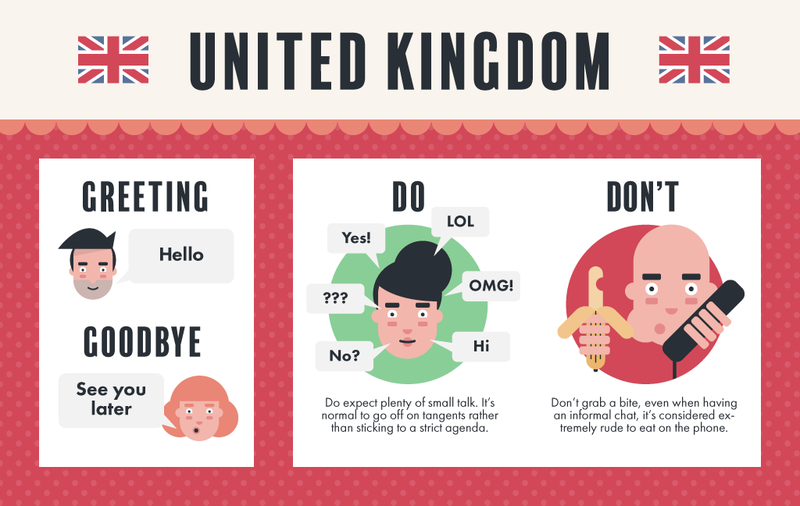 Politeness and manners are key parts of UK society, so expect plenty of niceties and informal conversation before discussing a business venture over the phone. Time is a valuable resource in the UK, so being punctual is extremely important. If you’re going to be late by a few minutes, a simple apology upon arrival will suffice, but anything longer than five minutes requires a phone call to explain why you are late, and how much longer you expect to be. Don’t be taken aback if you end up arguing with a client or colleague over the phone – this is considered normal. Food is a huge part of Spanish culture, so don’t turn down an invitation to dine before, after, or during a business meeting. 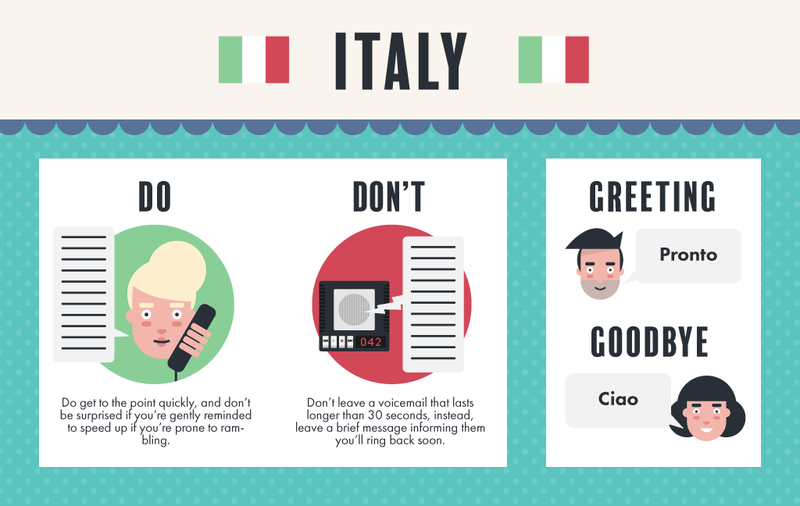 Italian’s don’t like to dilly-dally on the phone. 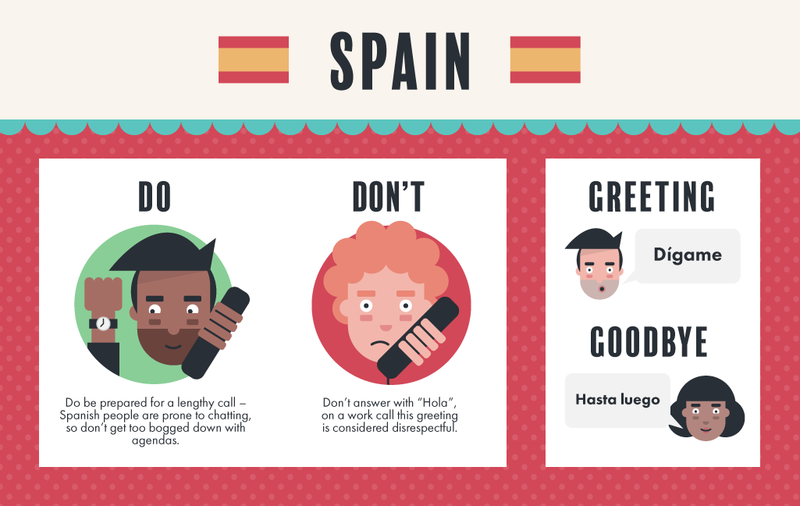 They start a phone call with the word “pronto”, which means promptly – so don’t take up too much of their time! Agility in business is seen as a positive, with rigid rules and formalities deemed unimportant. Long-term plans are often never realised, as Italian business tends to be focused on the short-term. Try to build a personal relationship with the people you are doing business with, personality and trust are vital elements of an Italian business deal or partnership. 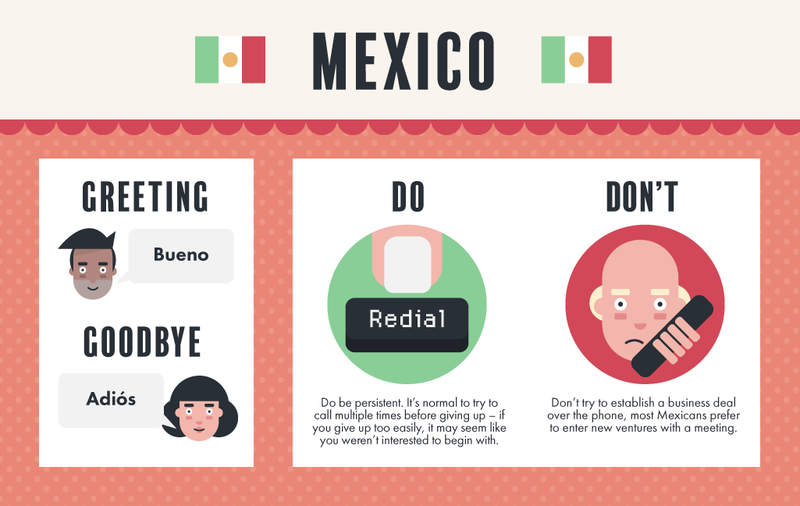 Mexicans may answer the phone with “bueno” which means good. This originates from a period where phone connections were unreliable, so this confirmed the call had been received. Be punctual to any face-to-face meeting, but don’t expect your hosts to arrive on time. Arriving within 30 minutes of the agreed time is considered acceptable, so try not be offended if you are left waiting. Senior members or managers within a company can appear aggressive and unreasonable, but this is simply to draw attention to their importance. 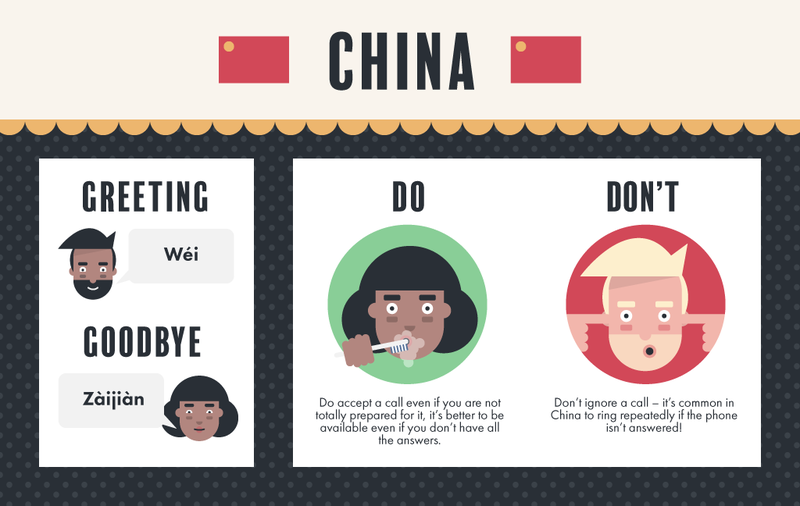 In China, it is always acceptable to answer your phone – even in meetings. It’s more acceptable to hold a full conversation under a conference room table, than ignore the call. In a country of well over a billion it can be hard to stand out, so personal relationships are an important part of Chinese business culture. The pace of life in India can change in a second, so be prepared for call interruptions from other departments or secretaries during a call. Building a rapport can be a significant factor in a pitch or business deal, so having photos of your loved ones handy can be a great way of forging a personal bond. Despite the incredible heat, a full suit for men and women is appropriate professional attire in the United Arab Emirates. If a meeting is conducted in a client or associate’s home, try not to admire a decorative item too much, as your host may feel under pressure to offer you it as a gift. Many Russians still treat telephone communication with suspicion, due to the vast number of intercepted calls during the era of the Soviet Union. 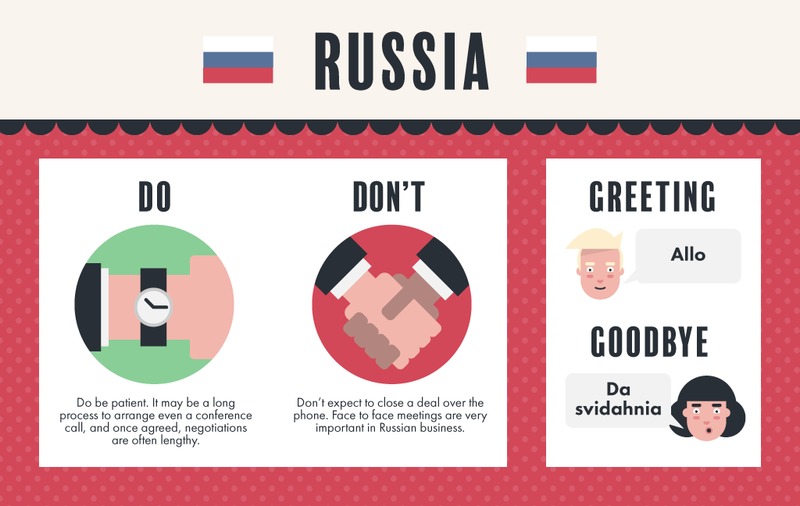 Gift giving isn’t an unusual practice in Russian business deals, but don’t give vodka as a gift, as this could be viewed as insulting (and playing up to a stereotype), try whiskey instead. Brazilians will often make gentle murmurs during a business call to show they can still hear you, a habit originating from the early days of unreliable phonelines. 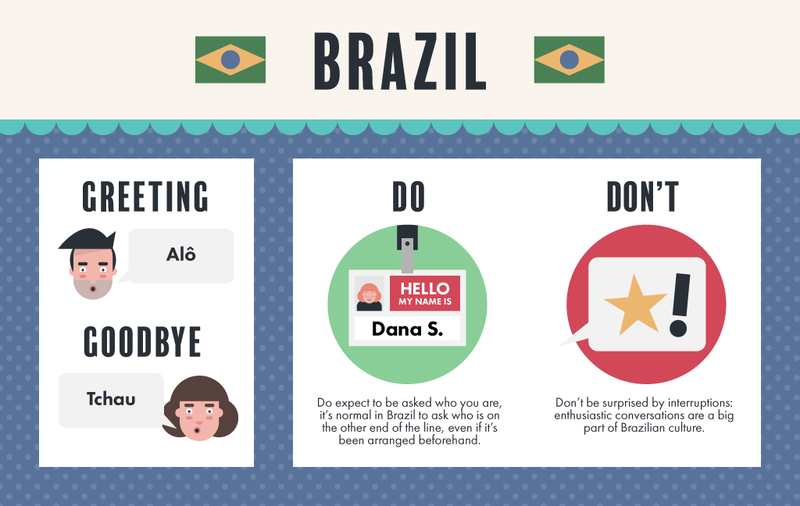 Brazilian culture is lively and expressive, which has a big impact on working life. An exuberant attitude is normal, so expect some physical contact and lots of informal chatting before getting into any type of serious discussion. 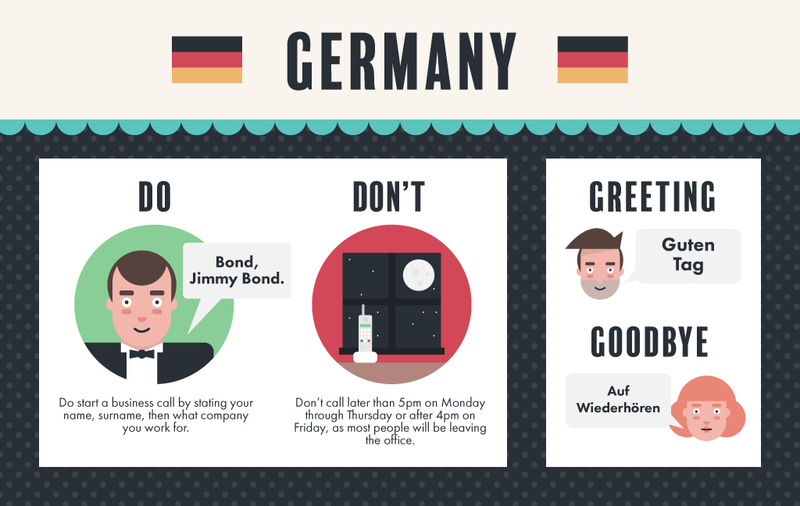 Germany is a very formal country, especially for business calls. It’s normal to use Herr/Frau (Mr/Mrs) then the surname of the person you are speaking to instead of a first name. Germany has a reputation as a nation of efficiency, directness, and plain speaking. These three elements are key parts of German corporate life, so don’t be put off if a client is forthright in negotiations. Respect towards authority and hierarchy are both extremely important, so if you’re attending a business meeting as a junior, don’t be surprised if you are never asked to speak. 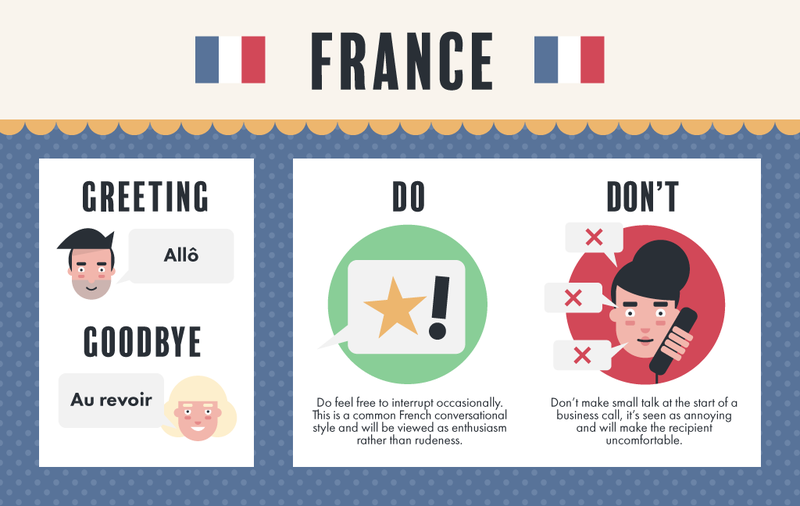 For small matters, don’t pick up the phone at all – French people prefer a quick email unless the matter is very important. 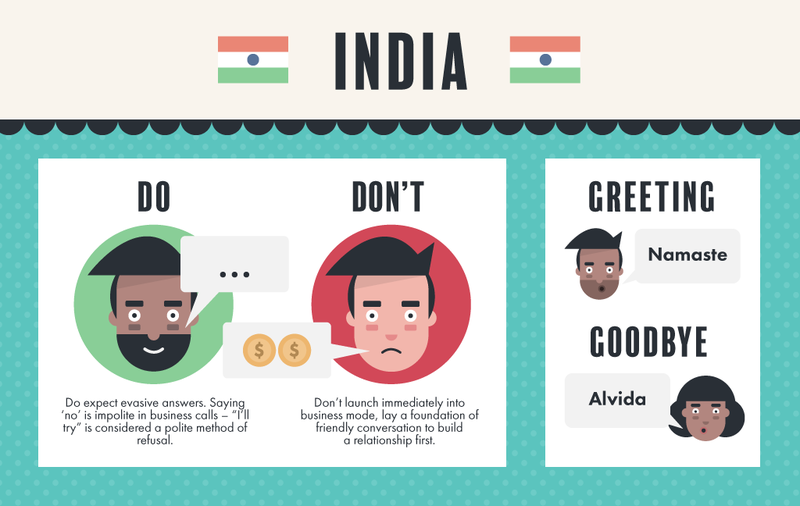 While it may be tempting to speak French, unless your pronunciation is perfect, don’t bother. Most French businesspeople will understand and speak English, and prefer not to waste time deciphering unclear dialogue. 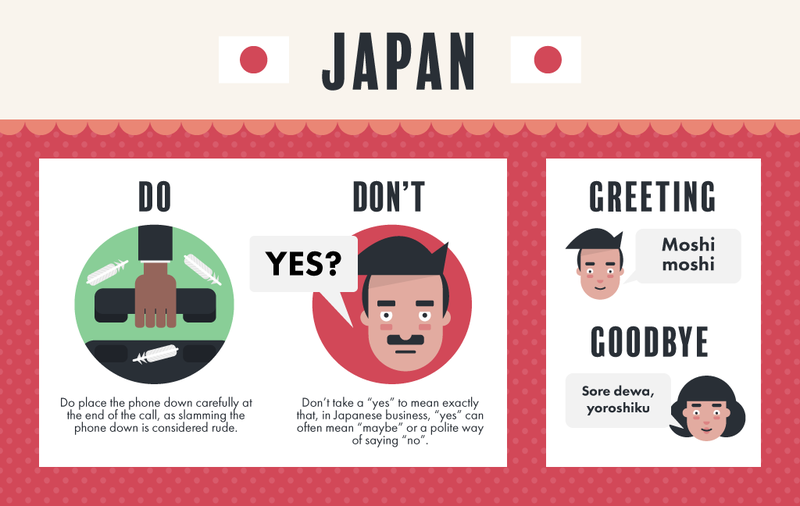 In Japanese culture, it is considered extremely rude to answer a phone call in a public place or on public transport – so make sure you schedule calls for times when you are both in the office. Conformity and unity are key aspects of Japanese business, with a group consensus usually accepted, regardless of whether an individual on the team disagrees. Hierarchy based on age or position is also a common trait of the workplace. This strict sense of order can make it difficult for a less senior member of the team to be taken seriously by a client in a higher position. 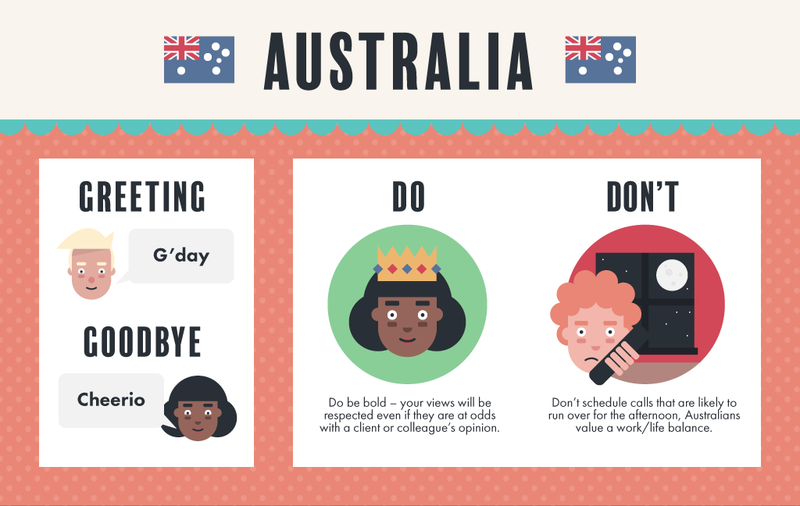 Business down under is often a relaxed affair, so avoid being too formal on client calls, and don’t expect the conversation to be purely focused on business. In Australia, a casual attitude towards business relationships can mean business and socializing often blend together. It’s normal to be invited to informal gatherings and BBQs by colleagues and clients, and its polite to bring meat and something to drink for your host in this occasion. Business in South Africa is based heavily on physical appearances. For this reason, important meetings should be performed in person, rather than over the phone. 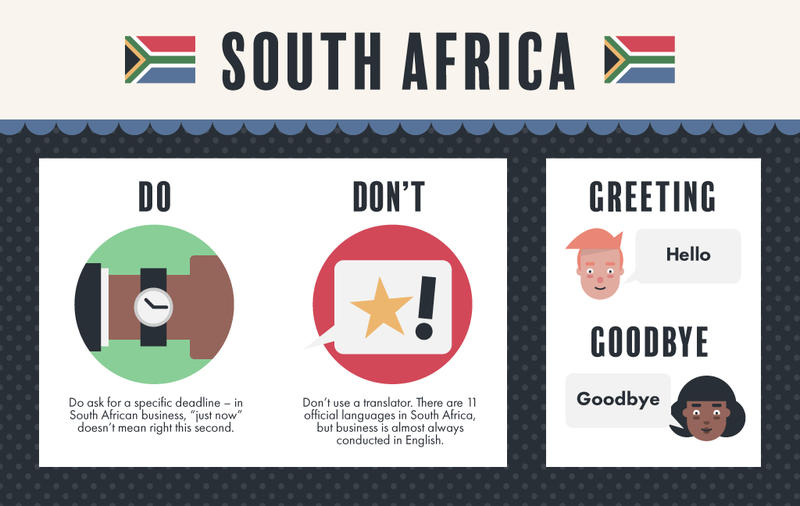 South African business is conducted at a slow, methodical pace, with key decisions typically made by senior members of a company – so don’t expect fast negotiations. 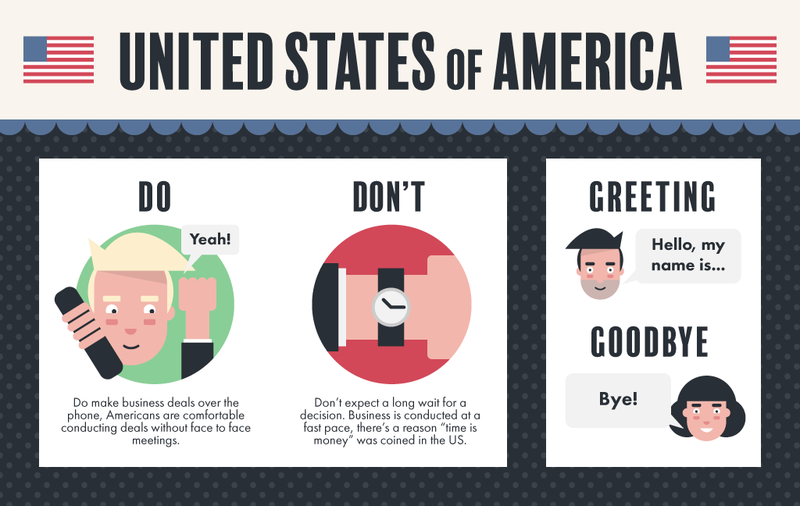 Americans are direct and straightforward with phone negotiations, there’s usually little subtext, and ‘yes’, ‘no’ and ‘maybe’ mean exactly that. While business meetings are informal, punctuality and deadlines should be strictly adhered to. Personal relationships aren’t important, the best deal or the best price will almost always win the day. To see more advice from our wide-range of experts, click here to download a copy of a Q and A with each of them.